In the last few months in Eastern Africa, an island barely an acre in size, languishing somewhere in Lake Victoria has been at the centre of a regional row pitting <?xml:namespace prefix = st1 ns = "urn:schemas-microsoft-com:office:smarttags" />Kenya against Uganda. Both Kenya and Uganda maintains that the small island belongs to it. The row, according to Joseph Nyagah, Kenya’s Cooperative Development Minister, “has adversely affected operations of fishermen’s cooperative societies in the region”. Similar sentiments have also been expressed by his Ugandan counterpart. 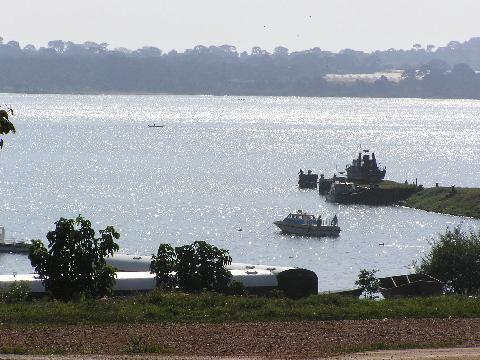 Meanwhile, conflicts over fishing grounds continue to rage around the lake with regular incidents of Kenyan fishermen being arrested by Ugandan and Tanzanian authorities ostensibly for trespassing continue being reported. Uganda has been requiring Kenyan fishermen to pay an annual fishing licence fee of UShs 1 million (US$ 512) while Kenya extracts a fine (which makes up for a licence) of the equivalent of UShs 5 million (US$ 2564) once Uganda fishermen are caught fishing there. As a concerned East African and more relevantly as a Pan-Africanist, this situation, to say the least, is laughable. How can we be calling for the unity of Eastern later on Africa as a whole when we still ponder on such irrelevant territorial issues as Migingo? So contentious is the Migingo issue that both Kampala and Nairobi have decided to waste already hard-up wanainchis’ (Africans) millions (in Uganda’s case billions) of shillings by setting up a joint Kenyan-Uganda technical committee to study and demarcate the border. The team, we are told, will make primary reference to ‘authoritative’ colonial texts and constitutions such as the British Order in Council of 1926 that established the current Uganda-Kenya boundary complete with coordinates, pillars and natural features. It will also rely on Schedule 2 of the Uganda Constitution (1995) – which was simply transplanted from Schedule 1 of the 1967 Uganda Constitution, The Kenya Colony and Protectorate (Boundaries) Order in Council 1926, and Kenya Legal Notice No. 718 of 1963, Schedule II Boundaries, Part I, the Districts, 37, Busia District and so forth. Like the galling sound of the London Big Ben timepiece striking ten, I bet their ‘lordships’, that pencilled these cruel and meaningless boundaries that make up the current nation-states in Africa, are busy laughing at what Presidents Kibaki and Museveni are so fiercely trying to determine and defend. Migingo is a pointless dispute. As I’ve often argued in the past, Africans played no part at all in the formation of the so-called nation-states in Africa. Our boundaries were drawn up by Europeans who had never been to Africa, whose disregard of our existing socio-political systems and boundaries is the sole cause of the current Migingo dispute. In fact, one striking feature that the Migingo tussle vividly illustrates, is that the so called independence we were granted is in actual fact ‘dependence’. The territorial dispute and the references sought to pre-colonial documents (as a possible resolution), indicates a collective colonised Kenyan and Ugandan mindset that is still soaked in cultural imperialism. The colonial structure of the nation-state in Africa has a lot to do with existing intrastate and state conflicts on the continent. The state in Africa has always been prone to violent as opposed to peaceful dialogue, diplomatic and political settlements of disputes have often been had to come by because African nation-states were in the first instance, artificially built to satisfy colonial interests. The problem today is that this anti-wanainchi political-culture practised expressively by the state has remained largely unchanged decades after ‘independence’. That is why many states in Africa often feel compelled to prove their sovereignty in the negative to those it deems a threat (such as journalists, writers, students, protesters or even other states). This has unfortunately led a large number citizens for whom the state cannot provide basic services to, to mobilise around a kind of frantic nationalism as we have recently seen in Kibera slum in Nairobi (Africa’s largest), where Kenyan youths uprooted a railway line to Uganda in solidarity with their brethrens in Migingo. The incident is thought to have angered the Ugandan president, whose subsequent “mad Jaluos” tribal outburst was interpreted by many observers as a reflection of his frustration with trying to bring Joseph Kony, the LRA leader (of Luo origin) in north Uganda to supposed ‘justice’. It is ironic, that instead of alleviating its poor wanainchi from hunger and diseases, Kenyan and Ugandan leaderships seem prepared to go to war whatever the cost in human and material terms. As a pan-Africanist and a prospective beneficiary of the amalgamation of East Africa, the tussle is a temporary set back. We should not allow it to be used by those against the union to stagnate or terminate the initiative. Military option that is being chanted out loud by Ugandan and Kenyan press alike is not in wanainchi’s interest or for that matter Uganda or Kenyan leaderships. Had Militarism been the finest option, then President Museveni would have annihilated Joseph Kony and the LRA, as he has repeatedly declared for the past 23 years now. This conflict will only be resolved through legal, diplomatic and political means. It is not a sign of weakness to give politics and diplomacy a chance. All conflicts on the continent have eventually been resolved by negotiations. One thing clear, whichever way the Migingo dispute is resolved, it has generated so much distrust and demonstrated that parochial nationalism runs skin deep in East Africa.